This is the first painting in a ongoing series entitled, The Hero Series." 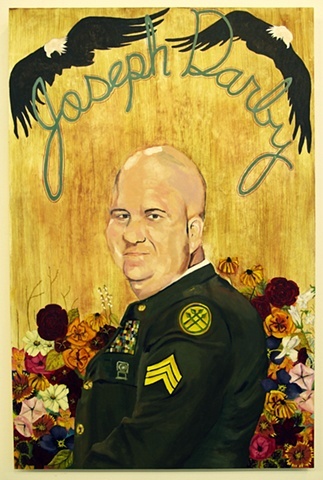 In 2004 Joseph Darby was working as an Army reservist who served as an M.P in Abu Ghraib Prison. While in service Joseph Darby received a CD that had images of torture that were taken in the prison. "It violated everything I personally believed in and all I'd been taught about the rules of war." says Darby. He also stated, "These were MPs. Our job wasn't to interrogate prisoners," He knew that he had to report the photograph, but he was also aware of the danger. Many people inflicting the torture and abuse in the photographs were colleges and people that Joseph has known much of his life. He decided to report the photographs anonymously to the U.S Army Criminal Investigation Command at Abu Ghraib Prison. Investigation proved several soldiers guilty of torture and violation of the Geneva Convention, or the international law for humanitarian concerns. Abu Ghraib is now internationally recognized as a site where the United States military tortured Iraqi detainees. Sergeant Darby did remain anonymous until Donald Rumpled publicly announced him by name as the whistle blower during a Senate hearing. The military sent Darby back to the United States early to avoid any vengeful acts from other soldiers. Most of the soldiers in Darby's unit however commended him and shook his hand, his hometown did not respond the same way. The Army Reserve did a security assessment and it was decided that it was unsafe for him to return home. His home was vandalized and he and his wife were rejected and labeled a traitor by their community friends and some family. "We did not receive the response I thought we would. People were, they were mean, saying he was a walking dead man, he was walking around with a bull's-eye on his head. It was scary," states Darby's wife. They now live in Protective military custody.